These macarons are amazing and a chocolate lover's dream come true! Dana's Bakery has taken the traditional French Macaron to a new level by creating uniquely American flavors inspired by classic chocolate desserts, pastries, candy and sweet treats! With the decadent flavors of Chocolate Molten, Red Velvet, Cookie Dough and S'mores, these all-American favorites are destined to please everybody! 12 piece assortment in an acetate box with a gold bow. Gluten free too! - made with almond flour. Makes a great gift for one or for a large party! These macarons are amazing and a chocolate lover's dream come true! 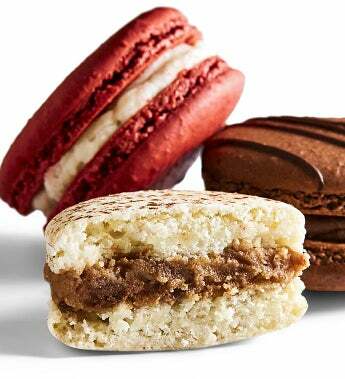 Dana's Bakery has taken the traditional French Macaron to a new level with flavors inspired by classic chocolate desserts! With the decadent taste of Chocolate Molten, Red Velvet, Cookie Dough and S'mores, these favorites are destined to please everybody! 12 piece gift box.